Importing all the necessary functions from last time so as to save some space. 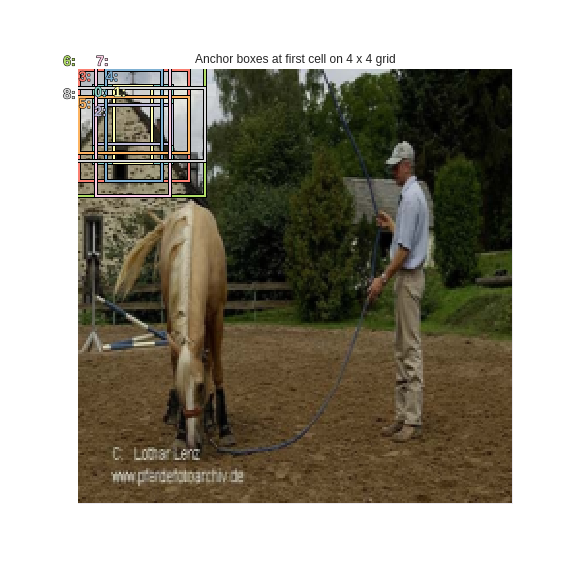 Till now we've only used the final convolutional feature maps of grid size (4 x 4) for 16 anchor boxes, which are of a fixed size and a fixed aspect ratio. Since the activations coming from the model can only modify the shape of these anchor boxes by 50%, the predicted bounding boxes can only do a good job on objects which are similar in size to these anchor boxes. 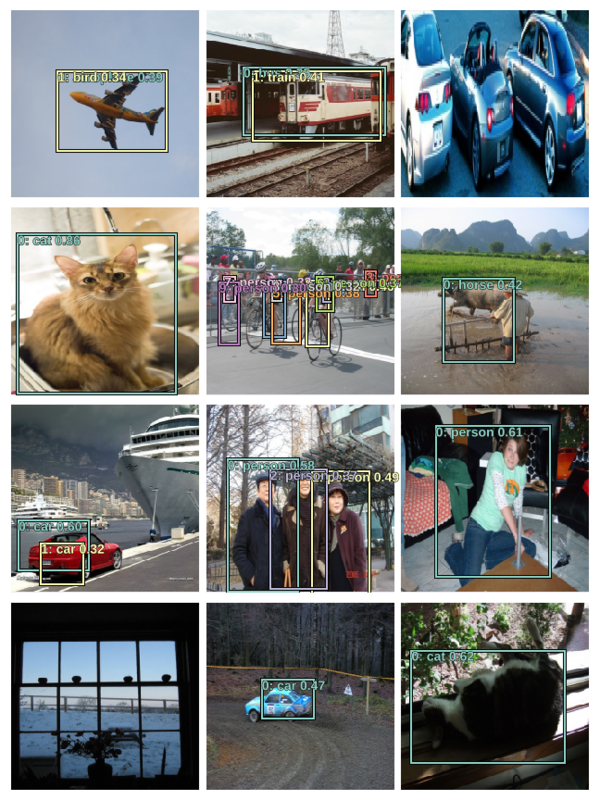 Hence, as seen in the validation results last time, the model is not able to properly localize an object which is larger in size than the maximum possible bounding box. One way to solve this problem would be to start with anchor boxes of varied shapes and sizes to begin with. We can also have these anchors lie on grids corresponding to different scales. Last time we had 16 anchors on a 4 x 4 grid. We can allow prediction of detections at multiple scales by adding more convolutional layers in the custom head and using their activations for predictions. 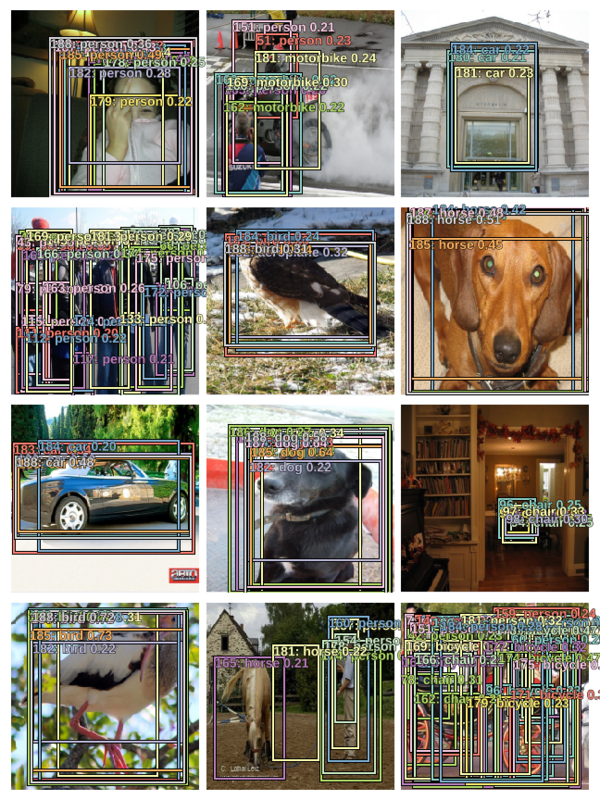 So this time we'll use activations from the convolutional feature maps of grid sizes 4 x 4, 2 x 2, and 1 x 1. We have 9 variants of an anchor box at a given grid cell location. We have a total of 189 anchor boxes this time. Let's plot them on an image to see how they look. As mentioned above the last 9 anchor boxes correspond to a (1 x 1) grid. Looks good. Let's plot the 36 anchor boxes corresponding to a (2 x 2) grid. Finally, the 144 anchor boxes corresponding to (4 x 4) grid. That's a lot of anchor boxes. Let's just plot the 9 corresponding to the first cell. Finally, let's plot all 9 variations on different grid locations so as to see the difference clearly. The corresponding anchor scaling is also plotted. By using all of these 189 anchor boxes we now have a much better chance of detecting objects of varying shapes and sizes. Time to modify the custom head. 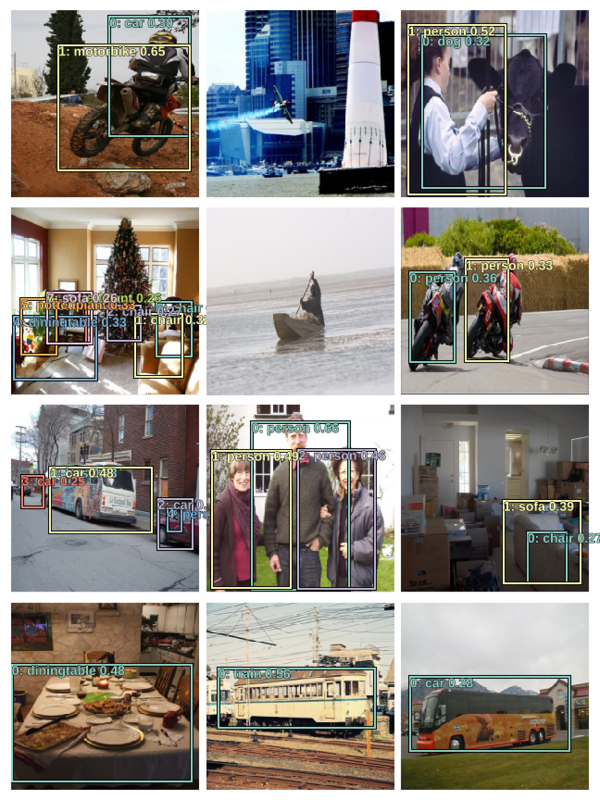 As mentioned above, we need to add 2 more convolutional layers with stride 2 and use the activations coming from all 4 layers for predictions. 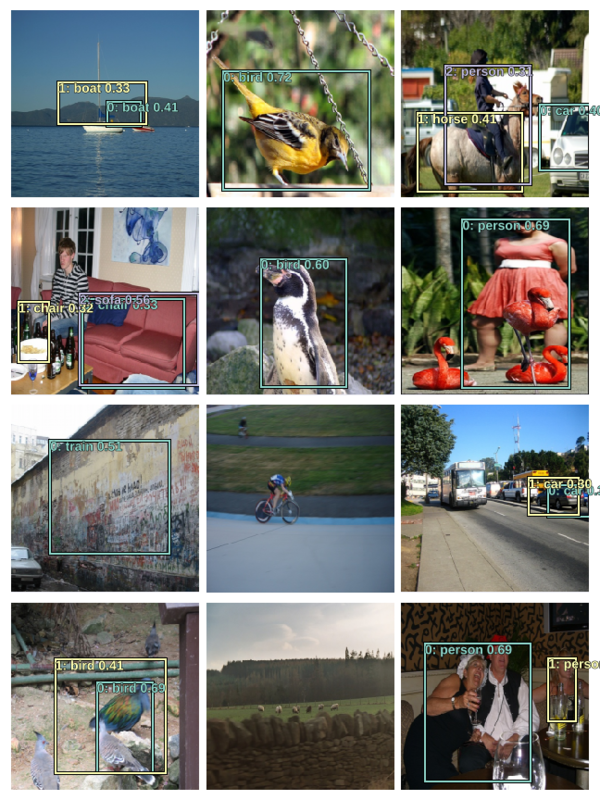 Copying the custom convolutional modules from last time. The ResNet backbone results in a tensor of shape (64,512,7,7). Let's put it through a Conv2d with stride 1 and 256 output planes. The above are the first set of activations that we'll use for predictions and these correspond to a 441 anchor boxes on a grid size of (7 x 7). 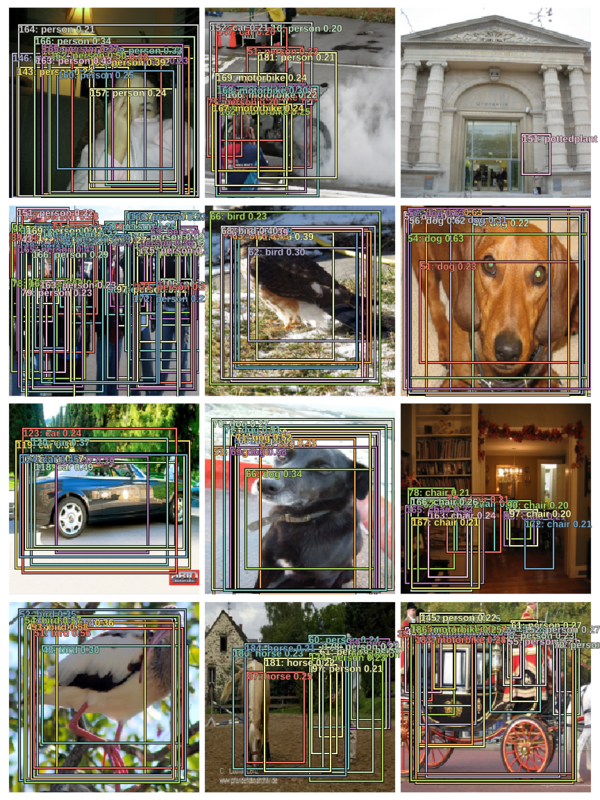 Next, let's have a convolutional layer with stride 2 that brings the feature map dimensions down to 4 x 4. The above are the second set of activations that we'll use for predictions and these correspond to a 144 anchor boxes on a grid size of (4 x 4). 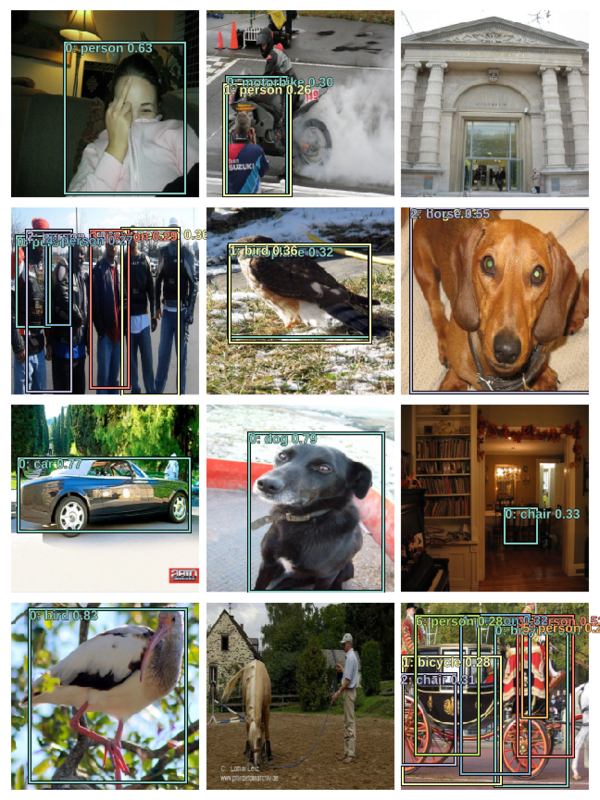 Next, let's have the final convolutional layer with stride 2 which result in feature maps of grid size (1 x 1). The above are the third set of activations that we'll use for predictions and these correspond to 9 anchor boxes on a grid size of (1 x 1). 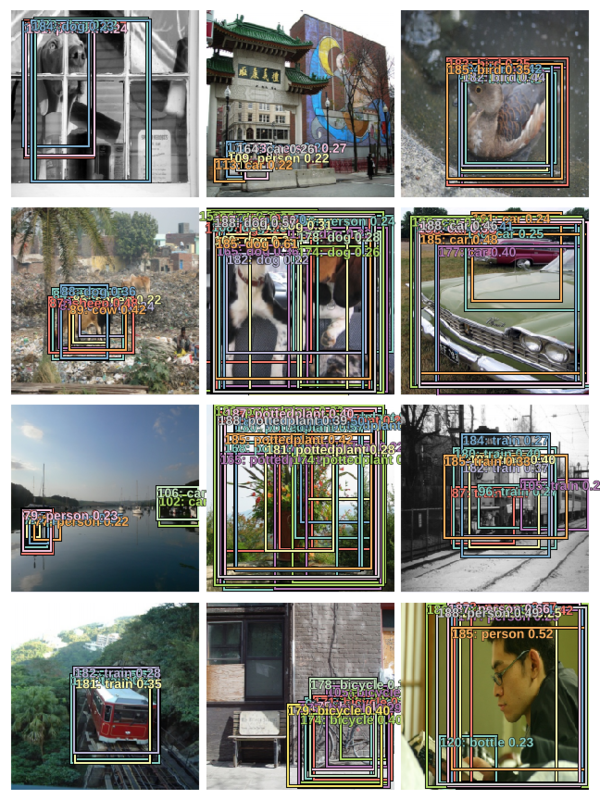 So we've changed the architecture from last time by adding 2 more convolutional layers. This model will concatenate these tensors and output a list of two tensors containing 189 sets of activations for both classification and localization as compared to 16 earlier. Let's put all of this in a single module. That's it for the architecture. The 189 anchor boxes are arranged in the order corresponding to the activations coming from the network, which means that the loss function ssd_loss from last time can be used without any modifications since the activations and anchor boxes are mapped one-to-one. Let's compare the above with the results from last time. As evident from the images above, the model is doing better than last time, especially on large objects. This is the result of using anchor boxes of different shapes at multiple scales. The loss criterion ssd_loss uses BCE_Loss as the classification loss criteria as defined above. Let's use focal loss instead of the standard cross-entropy loss to get better results. We can do that by simple overriding the get_weight method defined in the BCE_Loss class. 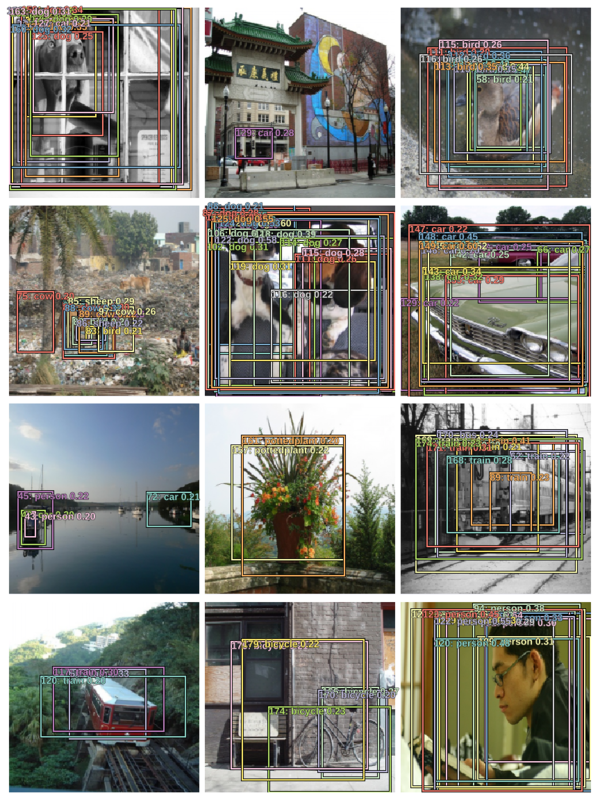 As seen in the results above the model is predicting multiple bounding boxes per object with varying confidences. We need have a mechanism to filter down to the most appropriate bounding box for a given object. This is done by Non-Max Suppression. Pick a pair of boxes. If they have a jaccard overlap of more than a threshold and they're predicting the same class, we'll assume they're predicting the same object, and discard the box with lower confidence. We do this till we have boxes where no two overlap more than the jaccard threshold. 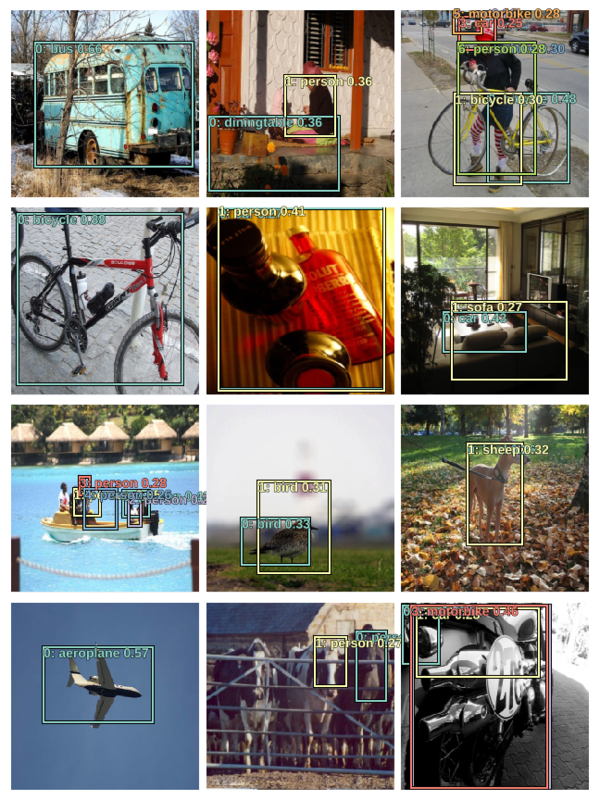 This concludes my initial exploration into the workings of object detection using deep neural networks. 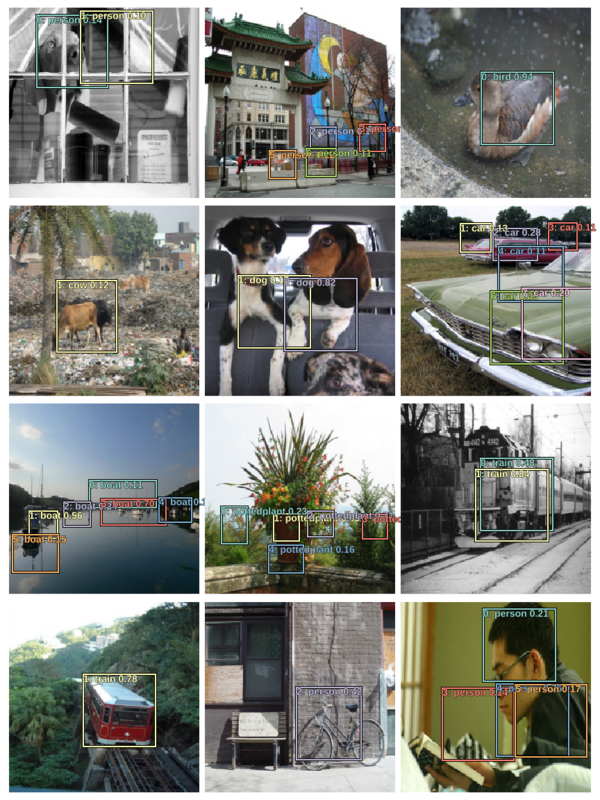 It took me a couple of weeks to fully grasp the concepts, and the whole exercise definitely improved my understanding of convnets.